For the special occasion of a child’s baptism, Istok Church Supplies presents a broad range of traditionally designed Orthodox baptism crosses. Hand crafted and hand polished, these classic crosses are a great way to celebrate and manifest religious identity. The Cross or the crucifix is the most important symbol of Christianity. Instantly recognizable, it is symbolic of Christ’s sacrifice to save humanity from sin and also serves as a reminder of the glory He brought to His Father. Wearing a metallic cross on a chain has been a tradition since ancient times. In Orthodox Christian tradition, it is customary for babies to be presented with a chain and metallic cross during Baptism– this serves as a reminder of the Baptism ceremony and our belonging to the Divine sheep. It is only through Baptism that we receive complete forgiveness for all our sins. By wearing a cross, we become one with Christ’s body – the Church. 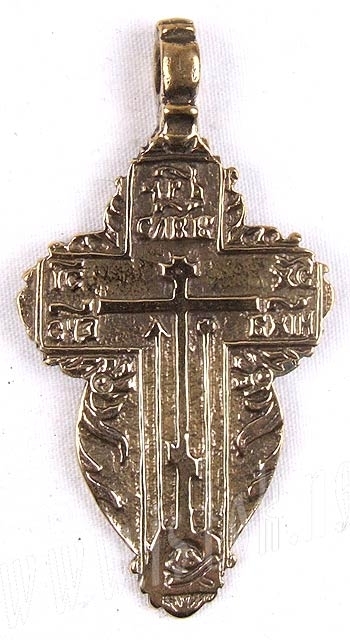 Hence, the baptismal cross has absolute value in Orthodox Christian culture. Orthodox Christianity concerns itself with keeping alive the purity of age old, sacred Christian traditions, culture and practices. As part of our efforts to help preserve and popularize this form of Christianity, we do a lot of research to ensure that we offer only genuine and authentic church supplies. When it comes to our baptismal crosses for babies, many of them are designed to be exact replicas of centuries old designs. Made of top quality brass, they are both intricate and elegant – designs that the wearer will love to wear well into adulthood. We do not use machines for their production – they are hand casted and hand polished – for an authentic and timeless appeal. Our variety of top quality gold and silver Orthodox baptism crosses are perfect for gifting on the day of Baptism - the parents are sure to appreciate your efforts in finding such a precious gift. So go on, and make someone very happy!